Vistafolio analyses, monitors and operates a model portfolio where the Partners' own money is invested. We apply this to client accounts in accordance with their risk profile and trading preferences. The strategy is to invest in quality, undervalued assets in developed markets around the world. We believe in investing in companies and sectors that improve the world and are poised for growth due to market timing, economic trends or events. *This shows the returns that have been generated by this investment strategy in the past. Annualised returns are after management fees and after withholding taxes. Your actual portfolio will differ from the portfolio that generated these returns. Important: it does not tell you how the investment strategy will perform in the future. Focus: Capital preservation, income and growth over 5 years. Key Markets: UK/Europe, North America, Singapore, Australasia. 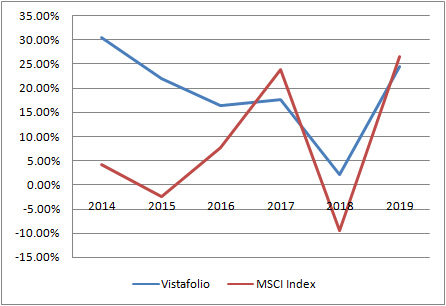 Returns on our model portfolio v. the MSCI World Index. While overall volatility is low, there have been a couple of months where returns have been +/- 5%. Please explain why. Our strategy is to preserve capital, generate income and provide stable and growing returns over time. The developed markets we work in and the quality companies we target are generally fairly stable. However, all markets are subject to macroeconomic events and thus a degree of volatility. Our most volatile months were July and October 2016. This was due to the Brexit vote in the UK. Immediately after Britain voted to leave the EU (23 June 2016), stock values plummeted and we took the opportunity to buy some shares at good value. In July, this strategy paid a 7.50% reward. However in October, Brexit concerns continued to weigh and some of this gain was reduced with a 5.70% fall. We continue to navigate Brexit opportunity for investors. How long on average do you look to hold each investment? Along with Warren Buffett, our ideal holding period is 'forever'. We seek to buy the best companies for you at the best time. However, the investment case for certain businesses is always changing. 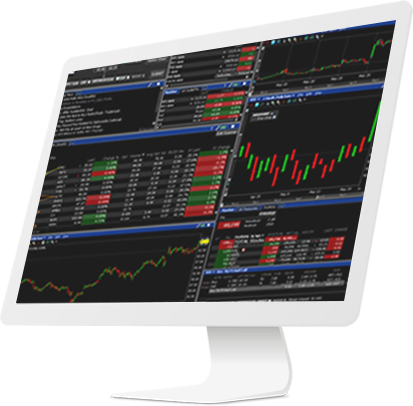 We review our holdings and targets in our model portfolio pretty well daily. If an investment case no longer exists or we have doubts about its future existence, we will look to exit that business at the right time - preferably once a profit has been turned. You can follow our strategy by subscribing to our newsletter. Your preformance reflects the rising bull market from about 2009 onward. How will things fare in the event of a correction or bear market? Our objective is to outperform the market and our benchmark index (the MSCI World Index). Investing in shares in businesses can deliver strong income and unrivalled growth. However, it is not without risk. Investing is for the long term. You need to be confident of your positions and the value at which you have purchased them. Market corrections are temporary. Statistically, bear markets and times of correction last for a much shorter time than positively growing markets. The essence of our strategy is enabling our clients to own positions in some of the world's best companies. No matter what the market is doing, these businesses tend to weather the storms and hold their value over the long run. For example we bought Auckland Airport at $3.50, and have continued to hold at $7.04 and $6.18. Essentially it is the same business, providing income through dividends alongside sector and region growth. Returns in 2018 fell sharply but not as much as the markets themselves which were negative during this year. How did you achieve this?. Although nobody is immune from steep market tumbles, we protected our positions with defensive buys. Against a fall in our benchmark MSCI Index of -11.21% (gross) in 2018, we held on to a gross gain of 2.17%, outperforming the market by some 9%! A primary objective of the share portfolios we create is to work the money and generate financial independence. This means seeking strong dividend yield. Despite the volatility in the markets through 2018, we delivered income of around 6.5% p.a. to account holders. We undertake in-depth study of the companies we invest in. This enables us to have a clear view of their value and potential. When the stock price sits well below the actual value, we know it's time to invest. When the sign at the park says "don't feed the ducks" - that makes us want to feed the ducks steroids. Well maybe we don't go that far - but to invest well you have to oftentimes go against the herd and break the rules others are following. That's a mental position, a way of thinking and way of approaching the market. We have some strong sector growth convictions that have been paying off. To learn more about these please subscribe to our newsletter.